This entry was posted in thanksgiving and tagged thanksgiving on November 24, 2016 by Jennifer Ofenstein. It’s time to talk turkey, specifically about Turkey Talk! So, there’s this idea I’ve had for a long, long time. 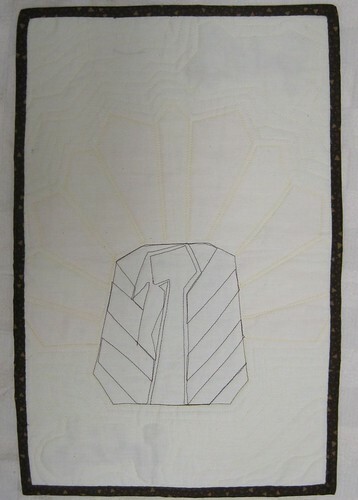 It didn’t really start to take shape until after I learned to embroider for The Project of Doom. Before that time, the design was never quite right. My turkey was too quiet. It was simple. He just needed a few words. Words are a miraculous thing. Once added, I couldn’t wait to get this wall hanging made to share with you! 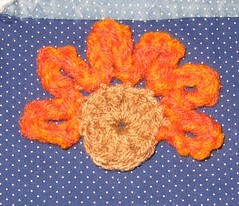 French Knot eye…see that embroidery is coming in handy! Gobble Gobble? That’s what he said! And, from the back. Guess who forgot to add a hanging sleeve? Dang it. Why does this turkey make me so darn happy? I couldn’t say, but he really, really does! 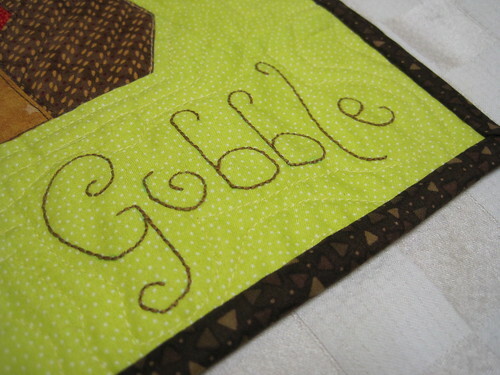 This entry was posted in -sewhooked website-, hand crafts, Holidays, paper piecing, shop, thanksgiving and tagged embroidery, paper piecing, quilt, sewhooked, thanksgiving, turkey, turkey quilt, wall hanging on October 27, 2011 by Jennifer Ofenstein. 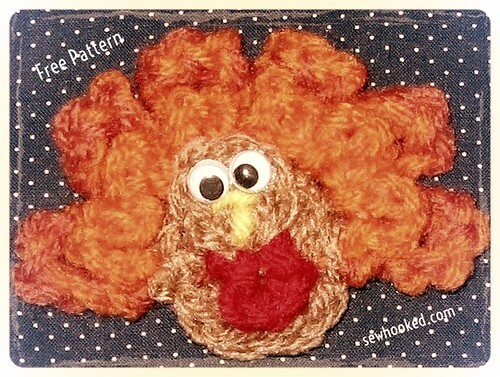 The date I wrote on the original copy of the pattern for this cute turkey is November 1999. The creation of the turkey came right on the heels of the Jack-O-Lantern Finger Puppet. I still think this little guy is too cute to be allowed. His appearance can vary based on what color of yarn you choose for his feathers and body. I made the one in the photo in a little under 10 minutes. Make one or a lot and share with your friends! 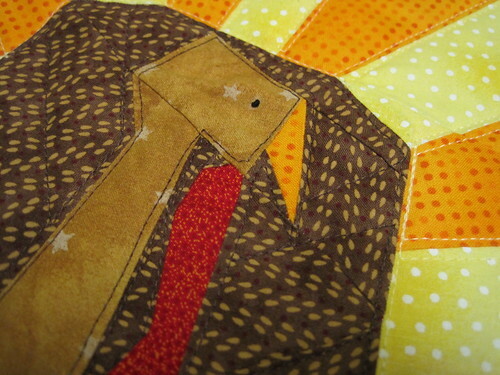 This is a very versatile pattern for a Thanksgiving Turkey. It works up very quickly and is cute, cute, cute! Front Feathers – with orange, sl st in front loop opposite back feathers, (ch 4, sl st in same st, sl st to next front loop) repeat to last feather, do not sl st in next loop. 6 front feathers made. Finish off. Head – with tan, ch 2, 6 sc in second ch from hook, sl st in first sc. Leave several inches of yarn for sewing to body. Wattle – join red to head with a sl st in back loop of any sc, ch 4, sl st in same loop, finish off. 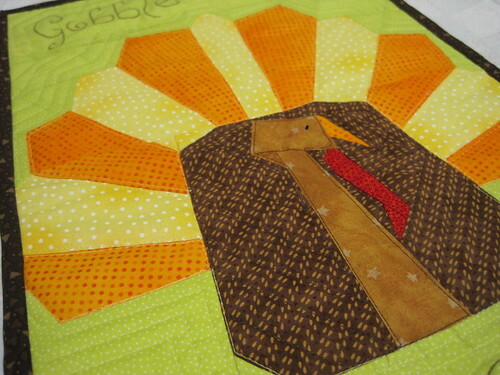 Beak – using yarn needle, sew yellow directly above wattle in a “T” shape, leaving top half of head free for eyes. Finish off. 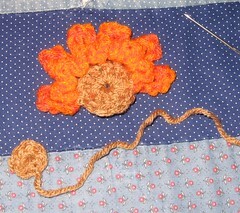 Assembly – placing head on top center of body, sew using yarn left on head. Finish off. Using low melt glue or Tacky Glue, attach 2 small google eyes. 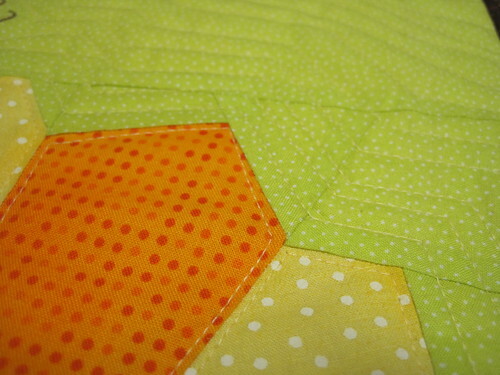 For Fridgie or Pin – glue magnet or pin on the back after eyes have dried. 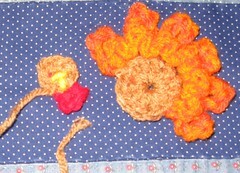 For Finger Puppet or pencil topper – crochet another body and attach to back of completed turkey by stitching around. Leave four dc open at the bottom for finger or pencil. Finish off. 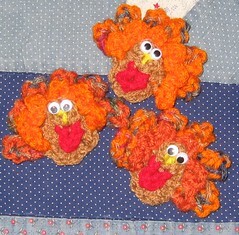 Visit the Turkey Craft Round Up and the Turkey Craft Round Up flickr group for more fun Turkey crafts. This is part of my “Way Back Craft” series; patterns, crafts, tutorials and general crafty memories before the days of the blog. 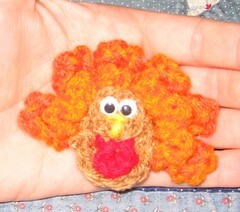 This entry was posted in crochet, thanksgiving, way back craft and tagged crochet, finger puppet, fridgie, hand crafts, magnet, pin, thanksgiving, turkey on November 2, 2008 by Jennifer Ofenstein.